Once you are done with setting up your WooCommerce store, and have installed all the required plugins, you are all set to integrate the plugins and get the best result out of it. Some plugins when used in conjunction with another works as a powerful tool to market your products and boost sales. For an WooCommerce store, a Dynamic Pricing plugin when used in conjunction with a Cart Notices plugin, works like a charm in driving sales to your store. In this article, I shall discuss how to use the Dynamic Pricing plugin by ELEX along with the Cart Notices plugin by SkyVerge. 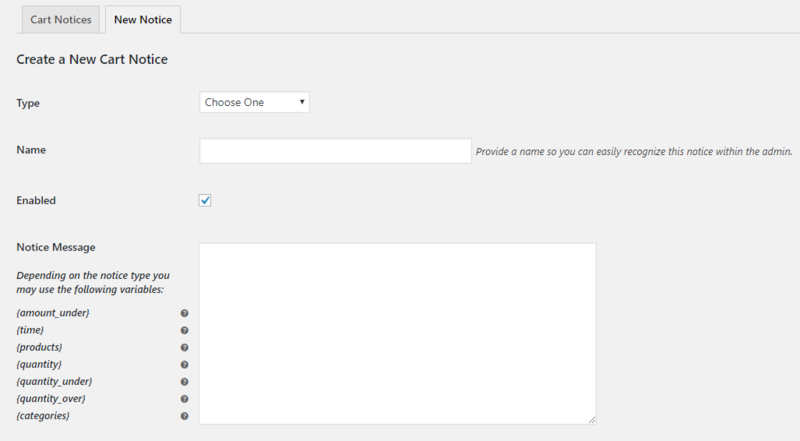 Dynamic Pricing plugin is used to provide discounts to products, categories etc. It is equipped with various ways of providing prices and discounts to users. If the discount is a product based one and is applicable right from unit quantity of the product, then the product page would show the discounted price by the side of the original price with a strike through. But, if the discount is not applicable from unit quantity, then the discount information might get missed by the customer. Thus, sometimes your customers might complain of not being aware of any discounts. In such cases, a Cart Notices plugin comes to the rescue. Along with its good number of usability, the cart notices plugin makes it convenient for the customers to be aware of all the available discounts. Both these plugins are easy to set up. For the purpose of illustration, let us take a simple example. 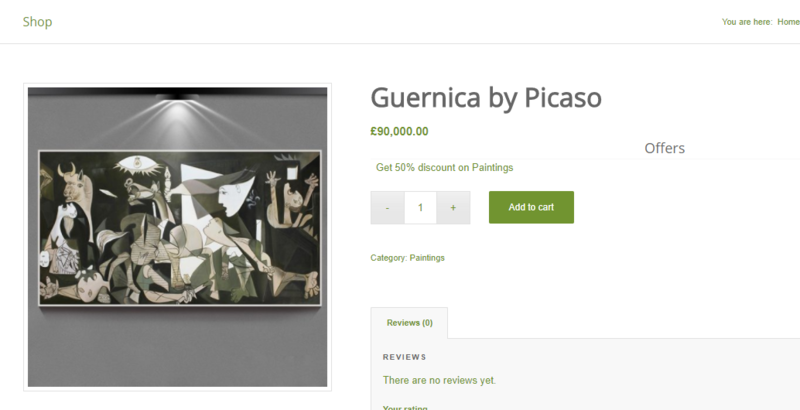 If a discount rule is created for a particular category say “Paintings”, such that for purchase of 3 or more paintings, the customer would get a discount of 50%. Further you have added a duration limit of the discount. 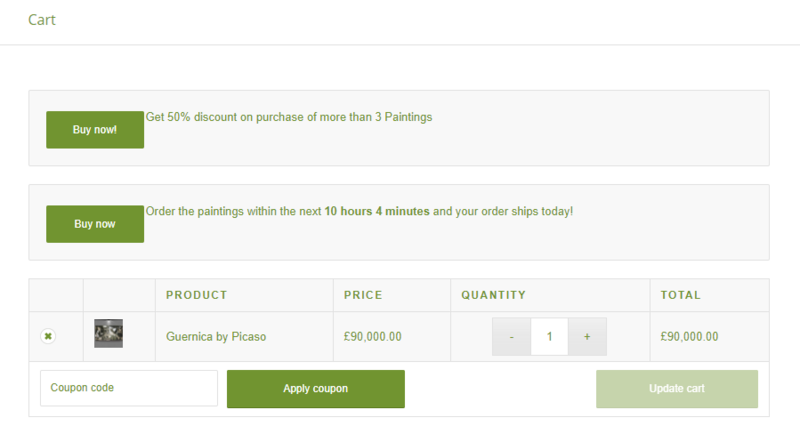 When a customer would open any of the product of the category “Paintings”, he would get to know of the discount from a text shown under offers. But, what if the customer misses the text message? Dynamic Pricing plugin wouldn’t show this information in the cart page. But, with the cart notices plugin, you can show your notices in the cart page and make your customers well aware of the available discounts and also for how much time would the discount be available. You can create a cart notices based on the criteria like “Minimum amount”, “Referrer”, “Deadline”, “Products in Cart”, “Categories in Cart”. Now, since the discount created in this case is a category based discount. So, we can create a cart notice of the type “Categories in Cart”. This is how the notice would appear, once a product of the concerned category is added to the cart. In the above case, two separate notices have been created. One to show the category discount and the other to show the duration of its availability. Now, suppose you want to give a Buy 1 and Bet 1 Offer. The “Buy Now!” button can be directed to the particular product. That’s it! A simple and straight forward way to make your customers purchase more than they intended to.